When I go out at night, I want my bag to be as stylish as my outfit, functional, so I can dance, and just the right size to carry my essentials. Many designers make the claim, but usually are lacking in one area or another. Enter Lara Bohinc. A jewelry designer by trade, Bohinc’s new handbag collections incorporate elements of jewel–like colors and details. 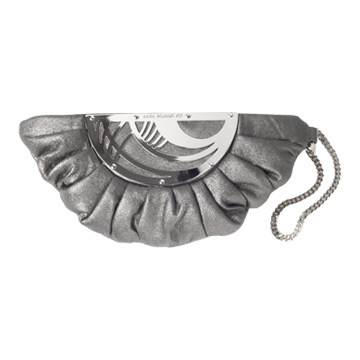 The “Melon Bag” in gunmetal metallic leather, is ideal for a night out. The beauty of the bag is in the details: the unique half–moon shape, continuous ruching and gathering, and a silver nameplate of the ‘art deco’ variety. A zip closure keeps your stuff safe, and a cute bracelet strap keeps you looking well–accessorized.